A conversation over at the 4Real forum prompted me to try to type out a description of how we have suspended our Advent wreath in the past but I just couldn't do it. I'm too visual, but I suspect a lot of you are too. My MIL was the first one to introduce me to a suspended wreath and they are breathtaking! There are so many different ways to do it... this is just the one that worked best for us. I started with an acrylic platter from the local party store and drilled holes in a cross shape. It doesn't have to be perfect. You can see that the two on the sides are a little off. Next, take one ribbon and pass it through the top of one hole, under the platter and out through the bottom of the opposite hole. Do the same for the other two holes. I used two different colored ribbons to demonstrate better. Here is where the method to my madness comes in. Go ahead and draw the ribbon ends up and tie them in a sturdy knot. I have always used a small hook that blends into the ceiling to hang it from. You will see that there is a chance your platter will hang lopsided. That's OK.
Slide the platter along the ribbons until you get it even. Then you can secure it on the bottom with clear packing tape. Place the candles in between the ribbons and you won't have to worry about anything catching on fire although you should never leave it unattended. I think you could also do it with a wire framed wreath and no platter, but I haven't tried that myself. We have always just set the wreath on the platter and usually it's fullness disguises the green below. Just don't tie the ribbons to the frame so that you can slide it to get it balanced. I found this picture in an older post that shows the wreath on the suspended platter. You can also see our completed one for this year here. Oh, that's perfect! I'm visual too and this did help me **see** what you were doing better! I COULD.NOT imagine on what surface you might place the wreath...I was trying to imaging hanging the wreath itself...and it wasn't looking pretty in my mind! BRILLIANT! The plastic platter! I have one of those in the top of my pantry! I'm so glad you posted your how-to! Very nice! I am visual and this is perfect. What a fantastic idea! Especially since I'm limited in the spaces I have where the little ones cannot get into the Advent wreath—LOL So, you just set your wreath on top of the platter, right??? It's that easy?! GREAT!!! I've been hanging our wreath since I read Maria von Trapp's Advent and Christmas book years ago. We had no problems until last year when one of candles tipped, unnoticed, burnt through one of the ribbons and the wreath collapsed. A burnt ribbon, a few broken candles, but easily replaced. So, watch those candles! I found an older post which shows the suspended wreath completed and updated with a link in the original post. Thank you for the photo, Charlotte! Neat idea, thanks for sharing!! 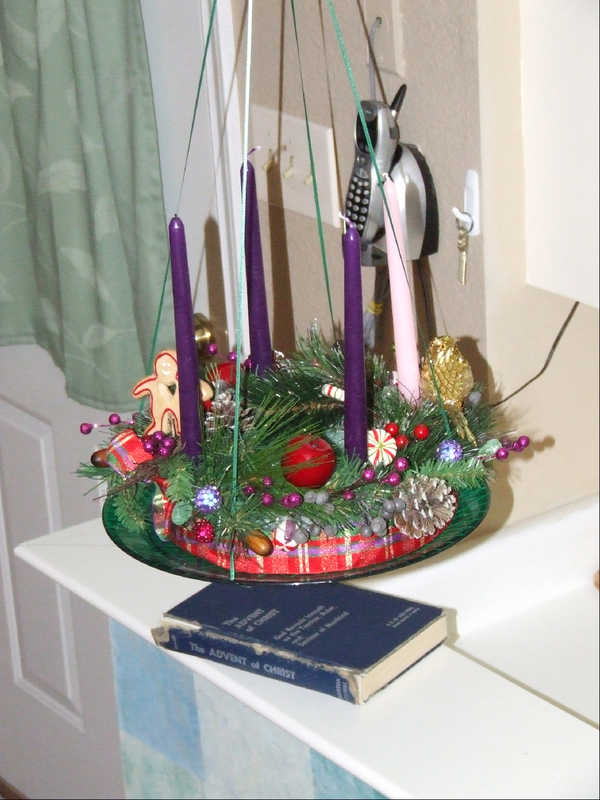 The church where I grew up always had a hanging Advent wreath, and it was the only one I'd ever seen. I haven't been followinf that thread, just too much else to read, but what a great idea. Looks wonderful.